In order to perfectly round out the month of May, the Harrington's were thrilled to come face to face with a three-day weekend. Monday, May 28th of 2012 happened to coincide with the lunar date dictating Buddha's birthday (or arrival on earth) and allowed many residents of South Korea to enjoy an extra day of sleeping in and/or exploring the peninsula. The Harrington's made the most out of the weekend by celebrating, barbecuing, camping and exploring. Saturday got off to a slow start with Melissa putting the finishing touches on a cover letter and resume for a dream job and Mike gathering the necessary items for a successful weekend which included tents, sleeping bags, home-made root-beer and home-brewed cider and beers. 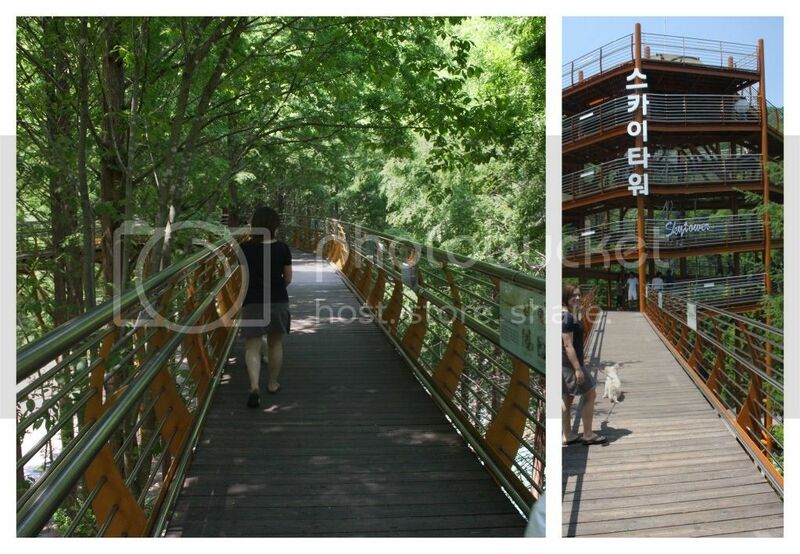 With their tasks accomplished and fully yearning for a get-away, the couple loaded up the car and headed just south of town to Jang-tae san a recreational forest boasting a Sky Tower and Tree-top Tower walkway. However, the forest wasn't the sole purpose of the Harrington's outing, rather the couple was heading off to a Pension where they would spend the evening and the following morning celebrating Ryan's (one of Mike's soccer buddies) birthday. The afternoon and evening were filled with barbecued duck, pork, beef, a few veggies, more than a few pitchers of beer and bottles of makgoli, birthday cake, food offerings to and from Korean families at the same pension, a roaring campfire and numerous drinking games. Morning came all too soon for some of those celebrating, including the Harrington's who struggled to sleep on the hard, heated floors of the pension. Regardless, the crew cleaned up their site, grabbed some orange juice, soaked up some morning sun along the river and went their separate ways with most returning to Daejeon while M'n'M made their way into the recreational forest and further South to the coastal city of Yulpo. As mentioned earlier, Jangtae-san boasts a Sky Tower and Tree-top walkway which provided the Harrington's a pleasant start to the day but were nothing entirely impressive or worth ranting about. Having enjoyed a short morning walk among the tree tops, the Harrington's and Lady Annyeong loaded up the Matiz and made their way south to Yulpo beach enjoying numerous country roads and the sight of farmers preparing their rice paddies. Arriving in Yulpo, the couple took a short walk with the pup before ducking into a restaurant for some Korean BBQ followed by a bowl of green tea naeng-myeon (cold noodles), a local specialty. 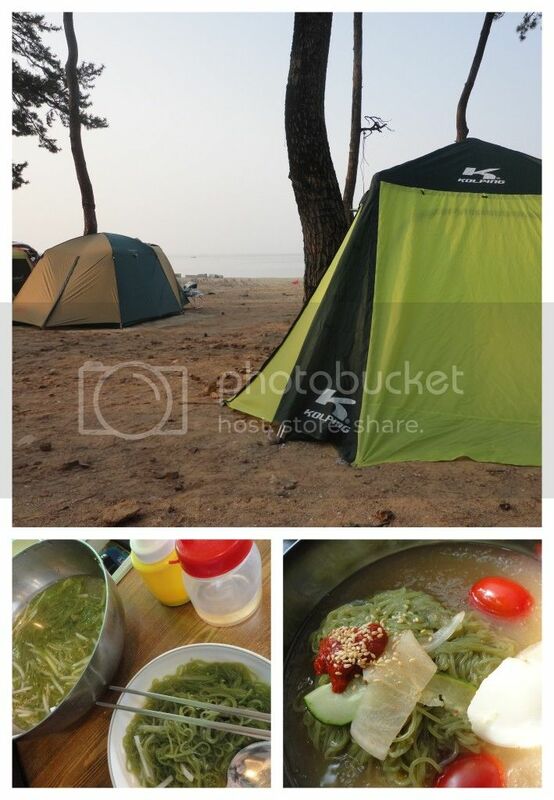 The couple was amazed by the simply fresh and refreshing taste of naeng-myeon and vowed to grab another bowl before leaving this southern region which is famous for their green tea based cuisines. Following dinner, it was off to find a location for camping. Opting to follow the rules, the Harrington's set up their tent on what seemed to be the edge of the designated beach campgrounds. With the tent and sleeping bags ready to go, the couple sat out on the beach with home-made cider and watched the "neighbor" children play in the sand and make occasional attempts at English conversation by shouting "HELLO!" and running back to their sand castles. As the sun set, the Harrington's felt their bodies desire to slip off into dreamland and prepared to enter their home for the evening. Unfortunately, it was about this exact moment when two large families moved onto the edge of the campground and miraculously found adequate space to set up their temporary homes and begin an evening of blow-torching their meat, shooting fireworks into the sky and carrying on in a rowdy manner. 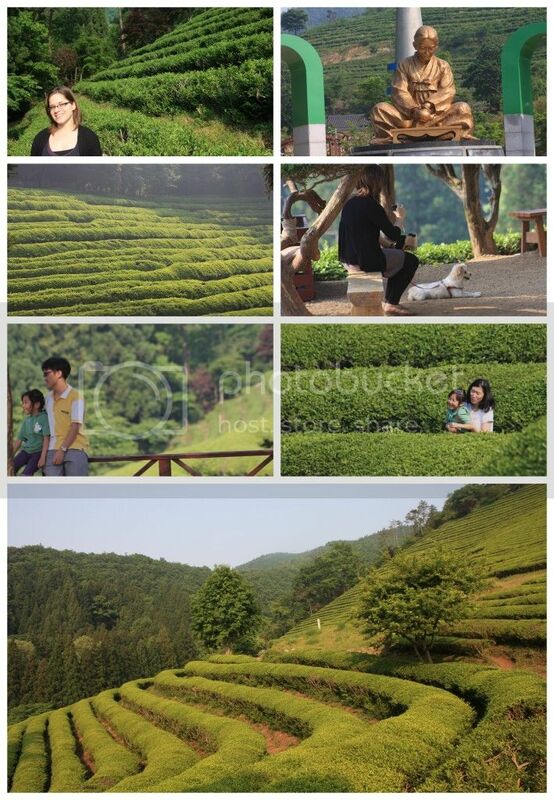 Fortunately, Melissa was exhausted enough to slip into a deep slumber regardless, unfortunately, Mike did not enjoy the same luxury and was not too disappointed when 6 am rolled around and the couple made their way toward Boseong's Green Tea Fields. Having depended on a guide book for information regarding the Green Tea Fields, the Harrington's arrived well before the crowds (perhaps even before opening time) and opted to follow a group of three older Koreans through a sort of back entrance which may or may not have been blocked off at the time of entrance. 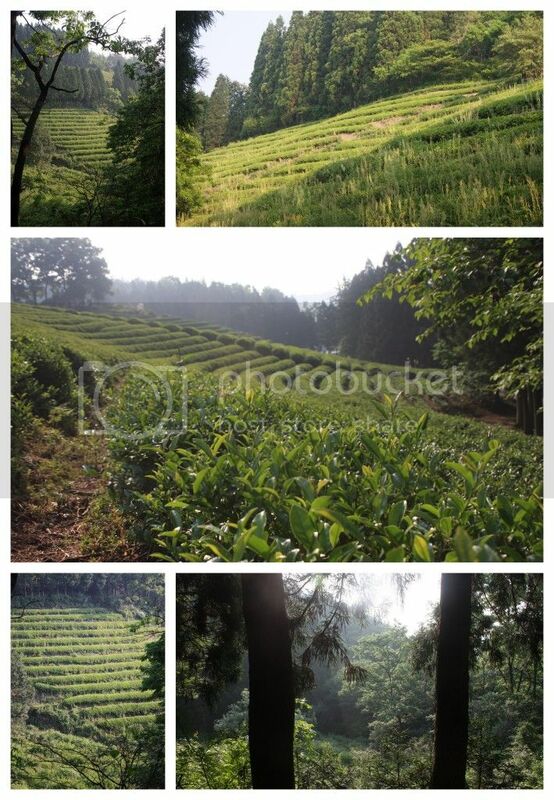 Upon entering the forested trail, the Harrington's enjoyed a peaceful morning hike in absolute solitude until they neared the more beautifully manicured green tea fields. Even with abating solitude, the Harrington's were struck by the beauty and freshness of row after row of green tea set against the mountainside with pine trees serving as the border. Having sufficiently explored and photographed, the couple made their way out through the front gates where they learned 4-legged (or 3.5 legged) creatures weren't actually allowed in the park. Of course, this discovery was not explained in words but rather the shocked expression of a park worker. Feeling slightly embarrassed but more grateful that they were on their way out and each had enjoyed a morning of hiking, the Harrington's made their way to a little eatery for another bowl of green tea naeng-myeon before packing up the car and taking nothing but the back roads before returning to their Daejeon home. While the three day weekend left the Harrington's feeling refreshed and filled with the joy that's only attainable from being among pine tree giants rather than concrete apartment giants, they would discover a few days later that Lady Annyeong brought a few souvenirs home with her in the form of ticks. Needless to say, the following week was spent caring for Lady Annyeong, disinfecting pillows and blankets and itching scalps with a sweet sense of paranoia.